Beth and I woke up on Day 3 in Cody, WY in the guest room of JT and Rayna and Malmberg. Rayna made us breakfast and we talked about our plans for the rest of the trip. They offered a number of spots they like to frequent in the park. While we were eating Beth noticed a large bird outside the window. JT realized their cat was outside and at risk of being snatched up by what he identified as a Golden Eagle. Luckily, Beth’s observation led to us scaring the bird of prey and its three buddies away before it was too late! The Malmbergs live North of Cody on a country road overlooking a pair of shorter peaks called the Rattlesnake Mountains. I’m a city boy at heart but I could picture the benefits of living out there (just not for cats). It’s not a lush landscape by any measure but it was beautiful. Cody also has the benefit of being just over an hour from Yellowstone National Park. JT and Rayna visit it three times a year! We got hugs goodbye and they treated us to a “Minnesota Wave” from their front yard as we drove off seeking our next adventure. We topped off our food supplies in town and headed West, Just outside Cody, a town named for “Buffalo” Bill Cody, is the Buffalo Bill Cody Dam, the tallest dam in the world when it was built in 1910 at 325 feet high. We did not take the Dam Tour because of both time and the dog but we did walk across it and take some pictures. The Dam Reservoir was a nice shade of turquoise. Anticipation was building as we approached the park. Sorry, The Park. The best one. I don’t have to see all of them to know it. Beth had been numerous times growing up but myself only the once. It would be both of our first times actually camping within Yellowstone. My family towed an RV on our one trip and stayed in West Yellowstone, Montana for three days. Beth’s family stayed in the park only once, normally sightseeing as they passed through, and even then only because poor weather necessitated closing the roads. Beth and I approached the East Entrance very excited. 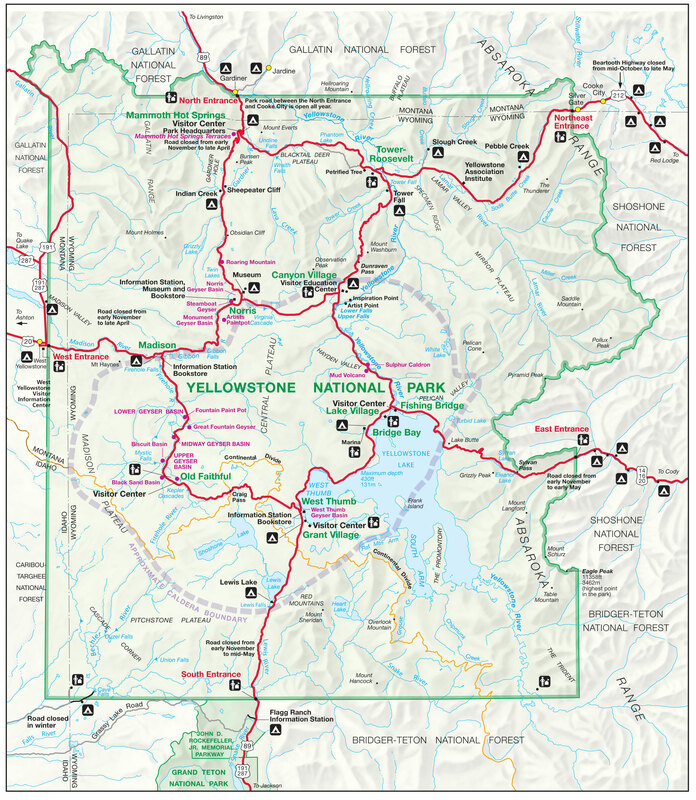 The entry fee for Yellowstone is either $30 for a week (per vehicle) or $80 per year (good at all National Parks). I highly recommend making the trip if you haven’t (and even if you have, go again). The Park Ranger that took our payment (I opted for the weekly pass) also gave us a park map and a few flyers about park safety. That included one about rules regarding pets. Pets are not allowed near thermal areas, in the back-country, near wildlife, or basically anywhere besides campgrounds and parking lots. Before I proceed with my post, a note; I don’t know exactly how descriptive I can be as we saw and did so much in Yellowstone but I’ll try. If you read my Trip #5 – London/Paris Honeymoon post you know I’m capable of long-winded writing. I do hope you’ll stick with me anyway. If not, here’s the summary: geysers, trees, wildlife, sunrise, tourists, mountains, and waterfalls! Oh my. I started out behind the wheel that day but after about three minutes of me asking Beth to take pictures of things we switched. The road from the East Entrance to the interior of the park is filled with little springs and waterfalls. I remember hopping out of the car and walking along the cliffs looking for them during my family’s trip. It’s sad but this stretch of road also passes through large swathes of burned forest. Many massive forest fires have ooccurred in Yellowstone over the years. Almost 800,000 acres burned in 1988, 36% of the park. Evidence of these forest fires is everywhere. Dead trees still stand mixed in with their shorter, green counterparts. It’s kind of haunting but also a sign of nature at work. We stopped and slowed down a lot to take pictures but our first real stop was at Lake Butte Overlook, a favorite of JT and Rayna’s. This overlook is the first spot where you can see Yellowstone Lake in the center of the park. The views are impressive as they pretty much are all over Yellowstone. This particular spot is 8348 feet above sea level and about 600 feet above the lake. It’s a great spot and the first one major one you pass when entering the park from the East. Back on the road below, we followed the lake at its Northern-most point passing the first thermal feature, Steamboat Point. It smelled of sulfur, no surprise, but what I found most interesting was it’s proximity to the water. It was right on the shore of the lake. For all I know the thermal activity also exists below the surface. I remember reading at least one sign somewhere that thermal vents exist underwater throughout. Very cool. The first “town” we came upon was Fishing Bridge. It’s not a town in the traditional sense but inside Yellowstone, sometimes road junctions are the closest thing. Fishing Bridge is home to an RV campground, a museum/visitor center, and a gas station. Gas prices in Yellowstone aren’t the best but better to fill up with expensive gas than run dry without a gas can. Beth was super frustrated watching an older gentleman from Florida pump gas at tortoise speed in front of us and the station was so small there was no room to maneuver. We eventually topped off the tank and I was able to clean the windshield and windows for better (less bug-splattered) sightseeing. Our route took us North from Fishing Bridge, now on the lower circle of the figure eight within the park (see map for reference). We were now following the beautiful Yellowstone River. Beth let me out of the car to take pictures of LeHardys Rapids but we didn’t stop a lot until we reached our campground in Canyon Village. 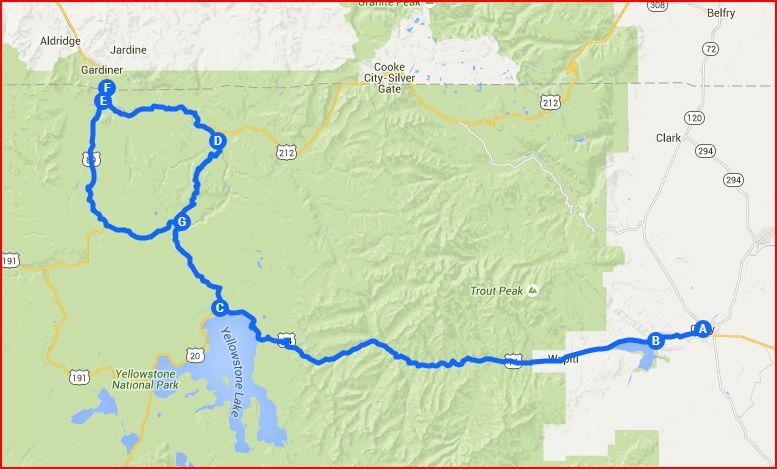 My plan for our first partial day in Yellowstone was to see the North Loop. That meant skipping over Mud Volcano and Sulphur Caldron South of Hayden Valley until the next day. I was hot to reach the North loop for two reasons. First, it was Labor Day, one of the busier days of the year in Yellowstone. I figured the South Loop, home of Old Faithful, Yellowstone Lake, and the larger geyser basins would be more crowded. Second, I hadn’t yet seen all of the North Loop. The road between Tower Falls and Canyon is always closed between October and late May and was still closed for construction during my previous visit with my family. That day we were there the weather was terrible too. It was rainy and cold. Back in 2015, my North Loop plan was in full effect, which meant we needed to book it for the campground. Check in went smoothly and I got the tent put up in ten minutes. It’s a pop tent so most of the time spent was blowing up the air mattress and moving stuff out of the car. A quick sandwich and we were on our way North! The views from the road I had never seen before were spectacular. We stopped at an overlook just past Dunraven Pass (8,859ft). I saw a guy climbing on top of a big rock and I headed out there myself. The rock, while big, had a passable trail up on the front side. I had to use my hands to steady myself while climbing but I felt like a real climber for a minute. I put on my sweatshirt before I left the car because it was a bit chilly up that high, a decision I was very pleased I made once on top of that rock. Not only was it cold but the wind on top must have been 25 miles per hour. It was inspiring feeling the power of nature on that spot. It was difficult to stand upright against the gale. Before leaving I took a deep breath and just enjoyed the view. I noticed an easier path down the right side of the rock and walked the hundred feet or so back to the car. I would love to actually hike Yellowstone the next time we visit. Exploring beyond the roads is now one of my life goals. A side road further to the North brought us partway up Washburn (10,243ft). This brings me to my first pro tip for visiting Yellowstone National Park; always take the side roads! Side roads lead you away from the main pavement that every tourist travels. In two trips to the park, now, I’ve found that for some reason many people stick to the main loops, never venturing to the gravel and sometimes one-way, one-lane roads. Don’t miss the main roads, of course, but take the side roads too! If a one-way road makes you miss something on the main road you can always double back. We certainly did. Chittenden Road up Mount Washburn was a fairly steep gravel road 1.5 lanes wide. There was no guardrail for safety. Fun! Fortunately, we didn’t pass any cars on the narrow road, There were six other cars when we arrived at the end of the road. It was, once again, super windy. We only stayed long enough to get pictures of the views but it was well worth the side trip. Always take the side roads! Our next stop was Tower Falls. Parking was a nightmare in the small lot. Dogs are not allowed on paths so Beth went first. While she was gone I noticed the hubcaps on my car were loose. I had some work done on the Cobalt in preparation for the road trip and I think they didn’t tighten the lug nuts 100%. For some reason they were scorching hot when I went to tighten them by hand. My turn to see the Falls was brief. Tower Falls is 132 feet high but I remembered it being larger and more impressive. In part that could be due to lower water flows in September versus July. We saw way better waterfalls the rest of the trip. There were several people in the way of the best spot to see the falls and they didn’t move after taking their photos. Apparently, the North Loop wasn’t going to be completely devoid of annoying bodies in my way. At least I could take pictures over their heads! Back in the car, we continued counter-clockwise on the North loop. I noticed a deer off the side of the road and we doubled back to see it. It was a doe and her fawn. There may have been more of them hiding, of course, but we only saw the two (no more than three feet from the road too!). After the deer our next planned stop was the Petrified Tree a few minutes away. You can’t drive too far in Yellowstone without a reason to stop and that happened to be our next one. The Petrified Tree is the last remaining redwood in Yellowstone. It is tens of millions years old! The trunk that remains isn’t very tall or wide but the fact that it still stands is remarkable. There once was a second petrified redwood nearby but it was destroyed gradually over time as visitors took chunks of it home with them. The surviving trunk now has a tall fence surrounding it (probably should have been there all along obviously). Did I mention the Petrified Tree is down a side road? Always take the side roads! Our next destination was yet another side road, Blacktail Plateau Drive! One of my strongest Yellowstone memories as a teenager involved driving along this secluded one way route looking for bears. We found one way off in the distance down in the valley below. We had to use my dad’s binoculars to see him and even then, he was a small black blob. It didn’t matter to young Bryan, however, it was extremely cool! With this memory I knew Blacktail Plateau Drive was where I needed to be! This side road would take us six miles in the wrong direction but it was well worth the trip. This gravel drive is my favorite throughout the park. ALWAYS TAKE THE SIDE ROADS!! The scenery varies quite a bit in six miles. There are grassy plains at first and then the road meanders through a forest and along the top of a big valley. I asked Beth to pull over on a random pull over spot so we could get out and walk. The dog wasn’t allowed out of the car but I wanted to look around a bit. I didn’t make it forty feet off the road before stopping dead in my tracks. Beth was still close to the car and I speed walked back to her. All I could say was “Buffalo, buffalo, buffalo!”. She couldn’t see what I had seen and was really confused. I told her we needed to get back in the car and we drove slowly forward. Just around the next little hill she finally saw what I had discovered, a lone buffalo (I named him Phillip). I had been only thirty feet from Phillip. Neither of us could see Phillip from where we parked. He’s a really good hider! There are caution signs all over the place warning visitors to stay away from the wildlife. Bison can gore an unsuspecting person just for being in the wrong place. Stories of morons getting injured or killed in Yellowstone are in the news once or twice a year. I certainly wasn’t about to be next. That’s why we high-tailed it out of there. Having survived certain death, we continued on Blacktail Plateau Drive until we came upon a couple of cars. This area is hardly a secret for those seeking wildlife but you usually see fewer cars off the beaten path. This could mean only one thing, a bear! That’s Yellowstone tip number two, if you see a bunch of cars along the side of the road, it’s not a coincidence. There were at least six cars bunched up in total, three in front of us and two that came up behind soon after. As we were wondering where the mystery animal was, a park ranger vehicle arrived driving slowly the wrong way. He talked to the people in front of us and then it was our turn. “Hey guys, I’m driving the wrong way because there was a grizzly on the road that I had to scare off with my siren. Have a nice day.” A grizzly! On the road! We just missed a grizzly bear right on the road! Not a little black blob off in the distance, right on the road! If not for that park ranger trying to keep everyone safe, we could have seen a grizzly up close. Of course he did the right thing, but what a cool opportunity we barely just missed. I took a picture of him for proof. Always take the side roads. Back on the main drag again, Beth and I headed West towards Mammoth Hot Springs, passing Wraith Falls and Undine Falls on the way. 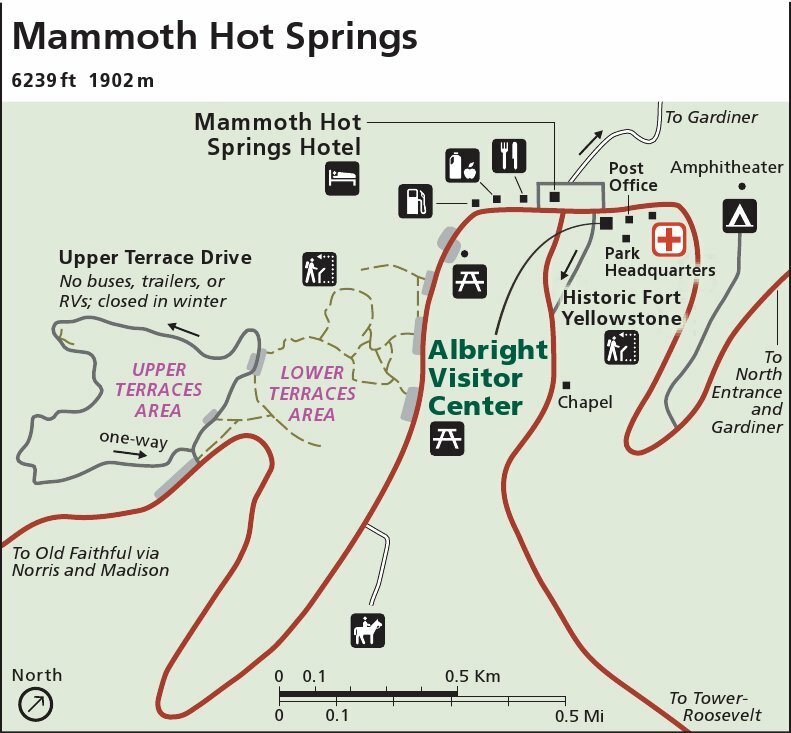 Mammoth is the largest population center within Yellowstone. I’m pretty sure it’s where all the full time park rangers live in the Winter. We pulled up on the main square around 7pm where a group of people were gathered around at least a dozen elk. These beautiful beasts were grazing peacefully despite the paparazzi twenty feet away (and everywhere). From what I know about elk herds, they are typically comprised of females, youths, and only one male, the alpha. The male in this herd (I’m told a herd of elk is called a gang) was very impressive in size. His antlers were enormous. Bucking what I thought I knew about elk herds, we saw a beta male thirty yards away eating in front of the Mammoth Post Office. He was clearly younger and a little smaller. Perhaps he’s still young enough to stay with his papa elk. In either case, he was eating alone. The Visitor Center was closing but I ran in quick to check out the displays about park wildlife while Beth fed the dog. Before seeing the rest of the sights in Mammoth we took a quick jaunt to the nearby town of Gardiner outside the park to the North. The quest was to enter Montana (State #4 of this trip) and see the Roosevelt Arch. Roosevelt Arch is named for Teddy Roosevelt and is one of the more picturesque entrances to Yellowstone. Unfortunately, it also happened to be under construction. Technically it was the roads in the area that were under construction but we couldn’t get very close to the Arch and all the orange cones in the way didn’t improve our pictures. On the way back inside the gate we saw yet another new animal, the Pronghorn. They’re adorable and I want one. Back in Mammoth we headed for the main attraction, the terraces. The lower terraces can be seen by foot on the wooden walkways common throughout the park. The upper ones are visited by scenic one way drive. Based on having Maeby along (and being tired from a very long day of sightseeing) we opted to take the scenic drive. We had the road basically to ourselves. It wound between geothermal features and mounds of travertine, some of which were actively steaming. We first passed over the top of Main Terrace and Overlook Terrace. The view of the lower terraces and Mammoth below from Overlook (aptly named) were fantastic. It would be a good picnic spot if the entire area didn’t smell like sulfur. We saw a couple more orange and white terraces and took a bunch of photos. The lack of other cars made it really easy to go at our own pace. It was getting late so we didn’t get out of the car very much. It was time to head back to our campsite. We left Mammoth and booked it South. We had wanted to cover more ground that first half day in Yellowstone but there was plenty of time to catch everything we wanted to see. We were stopped right around Indian Creek campground for elk crossing the road. At the time we thought we were witnessing moose and were terribly excited. Beth took a bunch of pictures with my phone (I was driving) and we both marked moose off of our mental wildlife sighting list. It wasn’t until I was looking through the pictures when we got home from vacation that I realized the stag we saw looked an awful lot like an elk. Both my dad and Beth’s dad confirmed it via email. Poop. So we didn’t see any moose for real but we ended the day on a real high. Even though I now know they were just elk, a common sight in the park, the road crossing at dusk was still pretty cool. The male was huge so I can forgive our mistaken classification. There was a long stretch of road construction where the road was in various stages of being torn up and re-surfaced. It took us another half hour to get back to Canyon Village and our tent. Thankfully, we made it back safe and prepared for a night of well-deserved sleep. Freezing cold sleep. End of day three.